Chris Brogan, co-author of The New York Times bestselling book Trust Agents and author of Social Media 101 posted this on [ entrepreneur.com: ] “…there are inexpensive ways to market your stuff, as long as you accept one fact: You’re also a media company.” In the article, he advocates for the use of Social Media, blogging and Email, advice with which I heartily concur (and I’m assuming that you already know you MUST have a website to make all of this “go” and to get found by your target markets). From a monetary standpoint, they cost next to nothing. They connect you with people immediately, 24 hours a day. He’s right: If you are on a shoestring budget you can still promote your business and expertise; but it is going to cost you in one area, and that is time. Here are some recommendations to help you build an integrated web, email, blog and social media marketing program, and become your own DIY marketing and PR machine. A Website.Not a blog, not a Facebook page and not a citysearch or other directory listing. You need NEED your own website with your own domain name. Why?Your customers aren’t looking for you in the yellow pages, they are looking for you online. You’ll be Google’ed, Yahoo’ed, Bing’ed and otherwise searched for online by your prospects, no matter whether your business is brick-and-mortar and locally based or virtual.If your competitors are online and you aren’t, guess who gets ‘found?’And in case you need more reasons: having a website gives you the opportunity to build your brand, before a prospective client ever walks in the door or places an order. You need a professional-looking site (which might mean different things in different industries) that (1) is visually appealing and stimulating to visitors (i.e, engages them and makes them want to know more), (2) has a clear call to action which enables and motivates site visitors to take the next step and (3) helps to educate your customers (making you the expert in your field). Connect with them emotionally so that they feel like your business is an important part of their life. Find ways to communicate your feelings about how important they are to your business (and you). Build trust and motivate them to want to move to deeper levels of engagement with your business. Become a valuable resource of useful information about your industry, your local community or another area of importance to your customers. Social Media.Specifically those platforms identified as most important in statistics everywhere including the 2011 Social Media Examiner’s [ report ] which listed Facebook, Twitter, LinkedIn and Blogging as the four most widely-used and effective social media marketing tools. Facebook. Probably the most important social media tool for which you need a strategy and a plan. Why? One in every eight minutes spent online is spent on Facebook. And one out of 11 people on the planet have a Facebook account. You need to be there, because your prospects and customers are there. Furthermore, there is a lot of data to support the assertion that consumers identify and interact with their favorite brands on Facebook for status and self-image as well as business reasons.Twitter. At a minimum, use Twitter to push out information that will pull followers back in to your website, Facebook page, blog and e-mail newsletter. In tomorrow’s newsletter, you’ll find a link to 17 ways to use Twitter to build business to build on. LinkedIn. LinkedIn is a great place to connect with peers, vendors, manufacturers and other industry experts. Don’t just use it to push your business, use it to connect with other people who share your interests and can provide you with useful and practical advice to help further your business. Seek out introductions and connections, join groups and become active in discussions. You’ll be sending negative messages if you neglect any of these forms of communication and marketing, especially after you’ve established expectations in the minds of prospects and customers that you are present and ready to help them. When you neglect your marketing, or fail to communicate often enough to maintain your visibility you may give the impression that you’re unprofessional and unreliable. Monday, Tuesday and Thursday (Weekly): Post a little something on your Facebook page (once every day would be better, but things happen!) and cross-post to Twitter with links back to your Website, Facebook page and/or Blog. Wednesdays (Weekly): Blog, and cross post to Twitter and Facebook (and your website, if you are maintaining a blogroll there). Even if you’re not a writer, you can do this! Blog posts can be brief. Post 3-4 paragraphs about something that interests you and would be likely to interest and engage your target market on your blog. This should relate to your business, be written personally and conversationally, should be something you wouldn’t be embarrassed to have your grandmother or high school English teacher read and should not generally be a forum for hard selling. Even so, you use your blog design and blog posts to stimulate readers to take the next step in engagement with your business. Build a bigger role for your business in the lives of your clients! 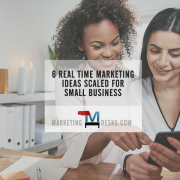 Elizabeth Kraus is the owner of Be InPulse branding marketing – 12monthsofmarketing.com – and the author of annual Small Business Marketing Calendars, 365 Days of Marketing, Salon Marketing Calendars and Make Over Your Marketing (12 Months of Marketing for Salon and Spa).